If you enjoy Christine's Pantry, tell a friend, family and co-workers! The history of honey is rich in tradition. This ancient substance has been used for food, drinks, medicine, gifts for the gods, barter, cosmetics, cooking, food preservation, cosmetics, art, etc. It has been used in religion, art, mythology, legends and literature as well as studied by scientists. The oldest written reference to the use of honey is thought to be Egyptian, of about 5500BC. At that time Lower Egypt was called Bee Land while Upper Egypt was Reed Land. By the 5th dynasty (c.2600BC) apiculture was well established and is shown in several reliefs in the temple of the Sun at Abusir. The use of honey was taken to India by its Aryan invaders and became associated with religious rites. Honey is also mentioned on ancient Sumerian clay tablets, possibly even older than the Egyptian reference. Later Babylonian tablets give recipes for "electuaries" medicines based on honey. An electuary mentioned in the 1st century AD by the Roman writer Pliny the Elder included powdered bees. It was said to be a cure for dropsy and bladder stones. Honey in first aid. In Ancient Egypt honey was the most popular medicament of all, it is mentioned some 500 times in the 900 remedies that are known. Honey was also a common ingredient of medieval medicines, for it was often the only substance available to make some of the more nauseating ingredients palatable. But in early cures and remedies, for instance those described in medieval leech books, honey seems to be cited for frequently for external than for internal use. Many properties have been attributed to honey which have no foundation in fact, as a cure for serious disorders such as consumption and the plague. Nevertheless, honey is used today in hospitals proprietary and dispensed medicines. In 1800 some archaelogists working in Egypt found a large jar of honey. They opened it and found that it tasted perfect even though it was thousands of years old. The shelf life of honey is sometimes quoted commerically as 2 1/2 years, but honey does not go bad as many foods do, it is still wholesome after decades. The oldest honey I have seen is in the Agricultural museum at Dokki in Egypt, where two honey pots from New Kingdom tombs (c. 1400BC) still have their contents in them. It is important to store honey under suitable conditions. If honey is not kept sealed it can deteriorate through fermentation, if it is stored at high temperatures...honey can deteriorate through abnormal chemical reactions. Honey bees were not native to the Americas. Aztec and Mayan cultures of South and Central America kcpt colonies of native, stingless bees for their honey and wax, mainly for use as a medicine. We do not know precisely when the first colonies of honey bees were brought to North America. Ships crossing the Atlantic in the winter carried bee colonies to Virginia before 1622 and to Massachusetts prior to 1638. The honey bee did very well in the forest clearings of early colonial America, using the abundant nectar and pollen available from the trees and shrubs native to the eastern U.S. As European settlers spread across the U.S., they took bee hives with them. Bees were recorded in Florida by 1763 and west of the Mississippi by 1800. Russian settlers carried bees to Alaska in 1809 and to California by 1830. The Spanish may have brought them from Mexico into the southwest before that date. Peel bananas and cut in halve lengthwise. Drizzle honey over bananas. Sprinkle with coconut. Add dollop of cool whip. Serve immediately. Enjoy! Oh boy, honey and coconut. I love them both. And I especially like bananas. Great tropical dessert here. I like that you used honey as a sweetener. Yum! Love coconut and bananas,...I bet with the honey this is to die for. Great recipe! Wonderful and simple! Love it. I love any dessert with bananas! Oh, I love this idea Christine! I'm not a major coconut fan, but I can see how it would mesh so well with the bananas and the honey. Definitely trying this! Sounds like an island dessert! Great combination of flavors for this one! This seems like a very quick and easy dessert or breakfast. I cannot imagine a jar of honey from ancient Eygpt. Fascinating! Oh my I must try this. Banana and coconut, it's like heaven. Thanks for this. What a great simple snack! Awesome flavor combo.. I have some bananas that are starting to brown so I think I know what I'll use them for! Erin's right, that's what I thought of...great tropical dessert! 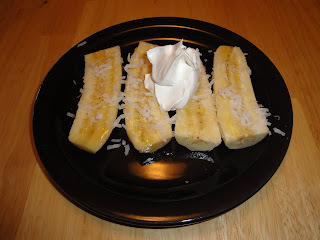 Great informative post as always..your bananas with honey and coconut sounds tasty. I love all of it..and will try it for breakfast! Hey everyone, I wanted to take a moment and say thank you so much for being a part of Christine's Pantry. I care about you. Such a tasty way to enjoy bananas! Some cool facts on honey, thanks! 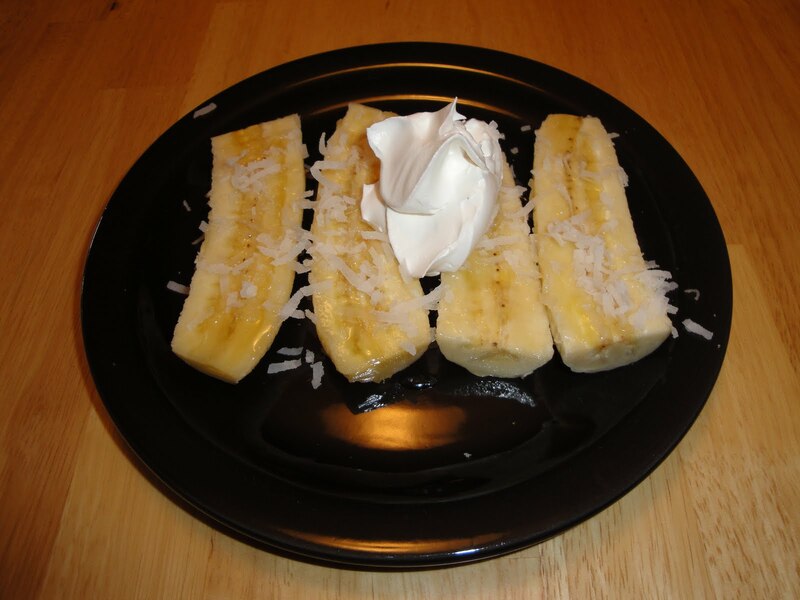 And it's a delicious snack, bananas with honey and coconut! It is such a simple dessert but so tasty and healthy. I haven't had banana for over 6 months since the Queensland flood as the price soar up to over $13kg. I miss banana!